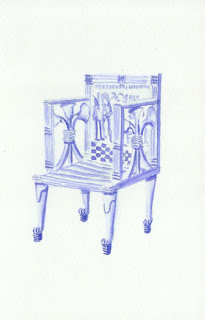 In ancient Egypt the chair was a symbol of authority and prestige. In modern days to own a replica of an Egyptian chair would seem slightly eccentric, and certainly attention demanding, yet these are for sale all over the internet. This replica throne chair is similar to King Tutankhamen’s Egyptian Throne Chair, from the tomb of the boy king. The original King Tut chair is 3,500-year old, and in a museum in Cairo. This chair is painted in the rich palette of Egypt, with blues and reds, and hand-finished with authentic gold leaf. Each 84 lb. chair requires a full two weeks to craft. A lot shorter than those pyramids took to craft, even with the slave labor.